And another Halloween card... 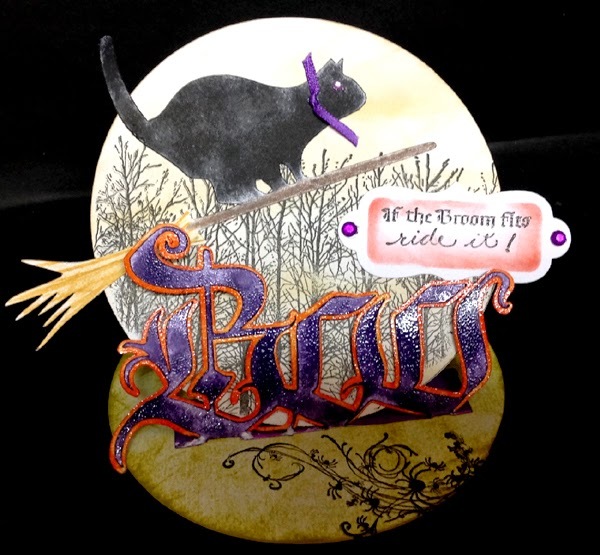 Using Quietfire Design Halloween Wicked stamp set and an eCut design "Boo" & "Kitty Witch" available on the Silhouette onLine store. I folded my white cardstock and then cut with my EK Success Circle cutter through both layers to create my circle easel card. I then folded the front piece. Cut another circle the same size and applied Distress "Antique Linen" all over to mimic the moon... Adhered to the front of my easel. Stamped the tree background (Just For Fun "Tree Line") using Versafine Black Onyx. eCut a large version of the "Kitty Witch" from white cardstock, colored with Distress pads and colored pencils and adhered to card. Added a purple ribbon tied in a knot and a light mauve rhinestone eye. Stamped the sentiment on white cardstock using the black, die cut with Spellbinders "Grommet Tags", sponged Ripe Persimmon" around the edges and adhered to card adding a couple purple rhinestones. Colored the floor, direct to paper using "Crushed Olive" mini pad. eCut the "Boo" adding a rectangle to the base and welding together. Colored with "Dusty Concord". eCut a shadow image and colored with the Persimmon. Adhered the two elements together then clear embossed. Folded the rectangle piece and adhered to floor. Stamped the spider spray (Inkadinkado) with the black. Wow, Yogi - this is amazing! I love the idea of a circle easel card - glad to have you join our humourous/punny challenge at Art Impressions! This is an awesome card! I love the sentiment, made me chuckle!! Love the images and coloring. Thank you for linking up with us this week at Jo's Fun~day Friday Challenge #63 (not #268) lol. Enjoy your weekend! Awesome card! Great big sentiment! Thank you for playing with us at Sister Act Challenge this week! Great card! Love the way this circle easel makes it look like a full moon in the back! Thanks for playing Squigglefly's challenge! What a fun Halloween card! Thanks for playing along with us at colourQ! Great Card! Like the shape and sentiment. Thanks for joining us at The Paper Shelter this week and good luck. Great shape. Don't you just love what you can do with the Silhouette? Thanks for joining us at Tuesday Throwdown for this challenge. Pretty fabulous Halloween card, Yogi! What a wonderful card Yogi, love the circle easel design. You are such a super great crafter. What a whimsically wonderful card. I love it.Thank you so much for taking time out your day to post your beautiful project with us this week . Thanks for joining us at AI last week! 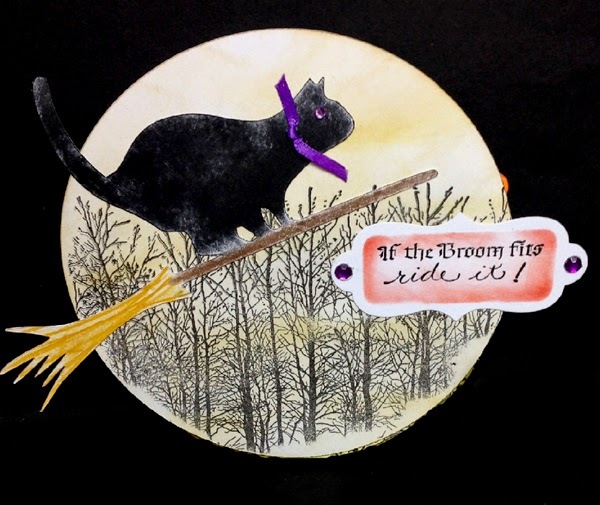 Way too cute...love the cat on the broom! Thanks for playing along with Jo's Scrap Shack.